In June 2013 Udinese Calcio relocated the football field closer to the main grandstand. The arched structure will be Stadio Friuli’s only one to remain unchanged. It went through a significant upgrade beforehand, though. 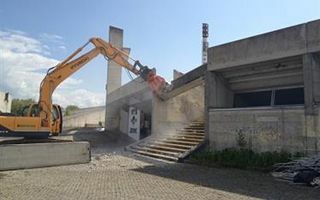 Demolition of the old landfill stands on three remaining sides was expected to begin back in the summer of 2013, but financial and formal challenges slowed the project down. Finally in April 2014 Udinese reached an agreement with general contractors and singed the deal. The three stands will be rebuilt by a joint venture of three companies dubbed the Ccc (Consorzio cooperative costruttori). Three companies form the entity: Ronchi, Icop and Pre System. They agreed to deliver all works within a tight budget of €22.6 million. First demolition works were launched in late April at the north stand, or Curva Nord for locals. Demolition is now visible to pedestrians and in autumn 2014 not only will all the rubble cleared, but the simple new north stand should be ready. Two following sides will then follow and the entire stadium should be revamped as the 2015/16 season unfolds. Udinese claim that entire works associated with the stadium, including previous pitch relocation, main grandstand upgrade and other tasks, should be kept within €50 million. This represents an increase from the earlier €40 million price tag.